FLOOD POOL: Volume 6,000 Acre-ft. Creation of a man-made reservoir in Minnesota - the Land of over 10,000 Lakes? That’s exactly what was proposed in northwest Minnesota near the community of Winger. This project as much debated but was designed to address a major water management issue in the Red River Valley - flooding. An awareness of topography of the Red River Valley and its flooding problems is essential to understanding how the Winger Dam can help to reduce flood damage. If you haven't been up to the Red River Valley, imagine a table top flat landscape with occasional trees lined up as windbreaks and scattered farmstead being the only features to break up the horizon. This area was totally barren 7,000 years ago after Lake Agassiz drained to the north. The soils deposited are now some of the most fertile soils in the world. While the flat topography allows for very productive agricultural practices, it also results in extensive flooding as any water rising over the top of river banks in the Red River Valley inundates not just low lying lands, but hundreds of square miles. Flood waters in the Valley take out bridges, culverts, and crops, subjecting the rich soils of the Valley to extensive sheet erosion. According to Minnesota Statute 103D, watershed districts are charged with the responsibility of managing the water resources within their respective district boundaries. Because of recurring flooding problems in the Red River Valley, the Minnesota Legislature allowed Watershed Districts in the Valley to form the Lower Red River Watershed Management Board (now the Red River Watershed Management Board or RRWMB) to levy local taxes to provide for flood control in the Red River Valley. To determine where the most effective flood control could be gained in the Valley, the RRWMB coordinated a timing analysis to determine when the peak flows on the tributaries of the Red River of the North reached the main stem. In the resultant 1984 McComb Knutson Report it was noted that the Sand Hill River's peak flow hit the Red River at the same time it was at peak flow. These results coincided with a Corp of Engineers study done in 1986. Thus, gated flood storage on the Sand Hill River has equal or greater potential for reducing basin wide flood damages than any other location in the Basin. As for Winger Dam, residents of the Winger area first approached the Sandhill River Watershed District (SHRWD) in 1977 regarding a possible project on US Highway 59. 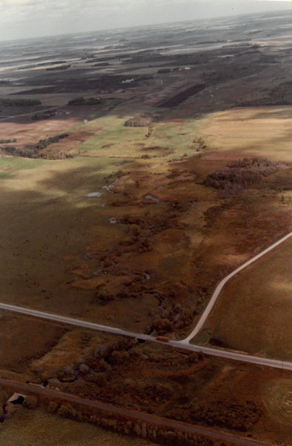 In 1980, the MN DOT contacted the SHRWD regarding a bridge replacement project at this site and the possibility of a combination dam and highway crossing was further explored. The Highway embankment would be raised and designed as a dam with a drop inlet structure to control floodwater levels. A 1200-acre recreation lake was planned and coordinated with the Section of Fisheries. It was planned to have a 22 foot maximum dept. at the structure and maintain a 17 ft. minimum depth for one quarter of the surface area. The area under consideration turned out to be an ideal area for water storage. It has 96 square miles of drainage area upstream from the project, which is significant for reducing downstream flooding. The proposed project site also has the necessary physical features for holding a large volume of water - a broad, flat valley well defined side slopes and little fall as opposed to a steep narrow valley which has little water storage potential. The reservoir would be about six miles long by .4 miles wide, covering 1,217 acres. Total holding capacity would be 11,131 acre feet of water with a maximum depth of 20 feet and an average depth of nine feet. Any loss of wetlands along the Sand Hill River would be mitigated for through wetland restoration nearby. In addition to flood control benefits, ground water recharge in the local area would be enhanced by retaining this water in the reservoir. Public meetings that were held in the project area over the years have been well attended. There is not unanimous support for the project, but the majority of landowners and residents in the area support the project and are anxious to see it proceed. Landowners who would lose land to the project would be compensated. It is projected that, in addition to flood control, the reservoir would also provide recreation benefits and residential development would occur. An improved local tax base and more people living in the area and purchasing local goods and services are just some of the expected local economic benefits. Downstream economic benefits along the lower reaches of the Sand Hill River and along the Red River relate to the avoided costs of flooding. The SHRWD has found good local cooperation on various aspects of the project. The county had agreed to fund the cost of moving the roads as needed. Local townships agreed to provide in-kind support by removing bridges in the project area and moving a town hall that would be impacted. Wild Rice Electric Cooperative agreed to move utility poles at no charge. The SHRWD had entered into an arrangement with the East Polk SWCD to cost share on various erosion control measures in the project area such as grass filter strips and sediment catch basins. City of Winger: set aside funds to develop and maintain trails to the reservoir and develop a public park at the reservoir. RRWMB: provide construction and maintenance funding support from its ongoing levy. MN DOT: had agreed to delay the bridge improvement/replacement on Highway 59 to accommodate project planning. MN Legislature: set aside money for the project via its bonding program. Since the projects inception, considerable discussion, data gathering, planning and analysis occurred including aerial photography, soil borings an environmental impact study, water quality monitoring, development of an operations plan for the dam and securing easements with local landowners. Working through the "system" to secure the various needed permits from state and federal agencies has been the most lengthy and frustrating part of the project. The main question being addressed relates to water quality that could be expected in the reservoir. The SHRWD has been involved with the MPCA in modeling of water quality both in the reservoir and of water that would be discharged from the reservoir. Results showed that water quality will approximate eutrophic lake conditions, which is similar to nearby Maple Lake, one of the most popular recreational and fishing lakes in the area. Details of the operating plan for the dam and reservoir were worked out. Flood storage had been the driving force for the creation of this project. To provide for the needed flood storage, the reservoir is designed to be able to rise six feet above the normal lake level which would store 6,880 acre feet of water. Gates at the dam would be operated to meter out the water for up to a 30 day period as the downstream river sections can handle the flow. The flood gates would be operated when the US Weather Service forecasts imminent flooding on the main stem of the Red River, i.e. Grand Forks, Oslo, etc. Otherwise, the reservoir would operate as a natural lake. The operating plan also provided for maintaining river conditions below the dam as it currently exists. The normal flow discharge would be "siphoned" off the bottom, bringing the oxygen level slightly above existing conditions. Nearly 40 years after the inception of this project and after much planning, public meetings and permitting processes, there is still no dam in place, but many partnerships have been formed and much has been learned about the development of such projects. The many permits and studies needed to advance this project have resulted in delays and a bit more costs, but they have served as a valuable role in fostering understanding between all project participants to ensure that a workable project emerges.